As a reward for the generosity of our Patreon donors, reward tiers are set up in Patreon now. $1 per month donors will be personally thanked on the podcast. $5 per month donors will have access to an RSS feed with select back episodes no longer available on the public podcast. $10 and $20 per month donors will receive a private RSS feed with access to all of our back episodes, as well as access the the member's only podcast. Details to follow. As always, we greatly appreciate anyone wishing to support the show using our Amazon Affiliate links (follow the link) when shopping on Amazon. No additional cost to you, a few extra bucks to us to fund the show. Don't forget to LIKE our Facebook Page. And join our closed Group. From Going Home - Imagine you’re driving down the interstate, it’s Friday and all you can think about is getting your weekend started. Then to begin the ruination of your much anticipated weekend the grating tone of the Emergency Alert System flashes over the radio, then promptly dies. This is the beginning of a 250 mile odyssey for Morgan Carter. Morgan works on the road and finds himself far from home when his car dies, as well as his Blackberry and every other piece of electronics he has. With no idea what has occurred he reluctantly finds himself on shanks’ mare carrying that ridiculous pack that everyone made fun of him for keeping in the car. Morgan has to find his way across the state of Florida, from Tallahassee to the heart of the state in Lake County. Along his way he has to seek out food, water and shelter where he can, not to mention keeping himself from being killed by any number of now scared and desperate people. During his travels he will try and help where he can, but that can turn out to be a costly mistake. We live in a wonderfully modern society where anything we want is a mouse click away. The lights come on with the flip of a switch and even a child can turn on the faucet at the sink and water always comes out. But what if it all went away? Could you face what Morgan faces, could you make the decisions he has to make? Life and sometimes death in the blink of an eye, could you do it? 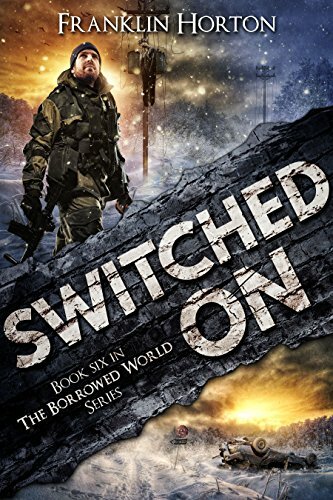 Switched On by Franklin Horton - It's been around 9 long months since the United States spiraled into chaos due to a cascading systems failure. The die-off everyone predicted has begun and after a hard winter nearly every other house sits empty with the owners dead or unaccounted for. Lately the power has flickered on and off a few times, raising hopes that power restoration is coming soon. But how do you put the genie back in the bottle? Violence is everywhere. Disease is rampant. Hundreds of thousands are dead. Insurance can never pay for the damage and loss that has occurred. The economy will take years to restore if it can be restored at all. From the recesses of a fractured government comes a plan to restore order and rescue what remains of the population. The first step comes with restoring power. But what if having access to electricity came at such a price that many -- like Jim Powell, his friends, and his neighbors -- would rather face a future in the dark.